Most Americans never get any closer to an ancient Greek temple or theater than the Travel Channel. Here in Sicily, we have the chance to see them, walk inside them, feel them, and see performances in them. And all of these I have been privileged to do. 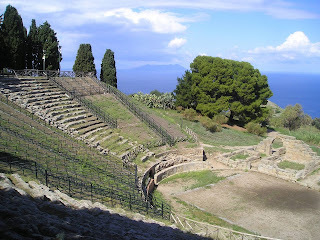 After attending my second performance at the Greek theater in Siracusa in June, I began to wonder if there were other theaters in Sicily that I hadn't seen. I already knew I'd seen all the remaining temples, but were there more theaters? I had been to those at Taormina, Segesta, Tindari, and Siracusa. Were there more? I looked in The Greeks in Sicily and found that there were two others. I made it my mission to see them, too. All are over 2,000 years old, and here they all are!